The Track - speed workouts meet every Wednesday at 6:30 p.m. from April 6th through September at Melas Park (1326 West Central Road, Mount Prospect, IL 60056). Notes: Come early to warm up. Then follow our coach thru a formal speed workout for race training at various distances. The Busse Woods Run meets Saturday at 7 a.m. at Busse Woods by the Elk Pasture (NW corner of Arlington Hts. Rd. 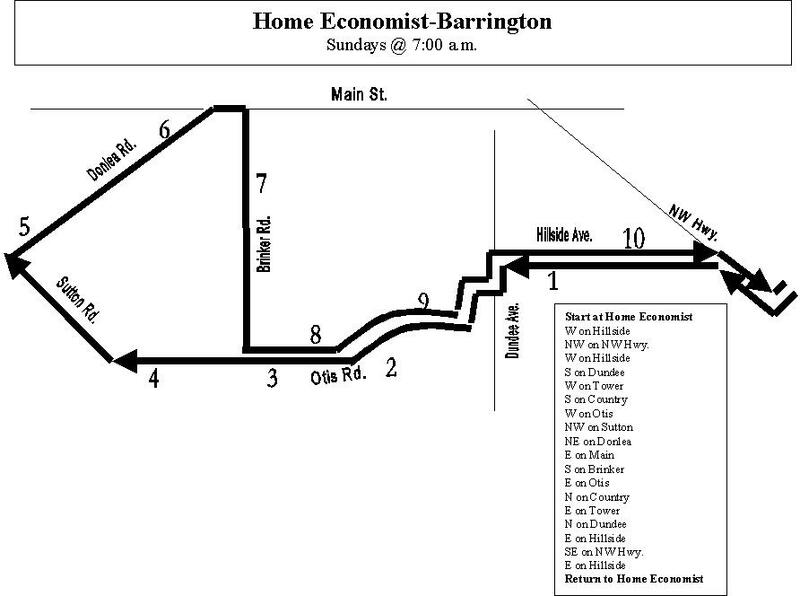 and Higgins Rd..
Notes: This is a relaxed pace and a run of 8 miles. Always followed by breakfast at Rose Garden restaurant across the street. The Sunday Morning Run meets every Sunday at 7 a.m. at Ace Hardware store parking lot at the corner of Northwest Highway and Hillside Rd. in Barrington (950 S Northwest Hwy, Barrington, IL 60010). Notes: Note: 10.6 miles, pace varies. Those tending to run a little slower start out a little earlier than the faster paced runners in order for all runners to finish at approximately the same time. The Saturday Morning Run meets 7 AM year round at Busse Woods, Meet at the entrance by the elk pen (N.W. corner of Arlington Hts. Road and Higgins Road). Notes: Make sure to bring your own fluidsl This is a relaxed pace run of about 8 miles. Make sure to bring a change of clothes to enjoy any impromptu recovery breakfasts. 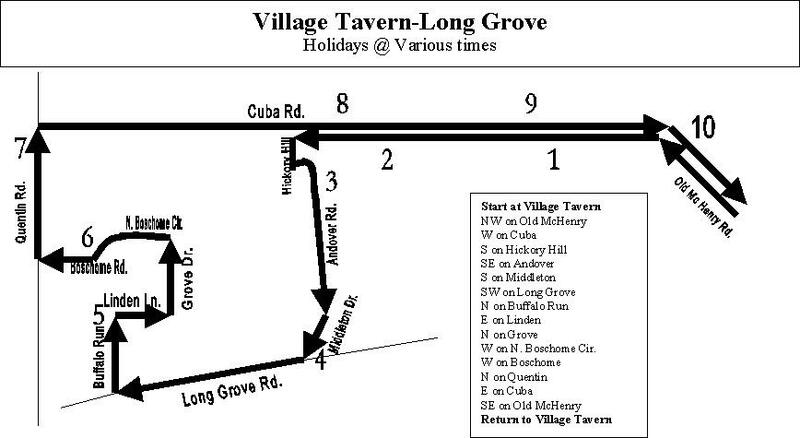 The Holiday Runs meet end of yr at The Village Tavern in Long Grove (on Old McHenry Rd just west of Robt Parker Coffin Rd) for a 10-mile run..
Notes: Thanksgiving 7:00 a.m.; December 24 7:00 a.m.; and New Year's Day 9:00 a.m. 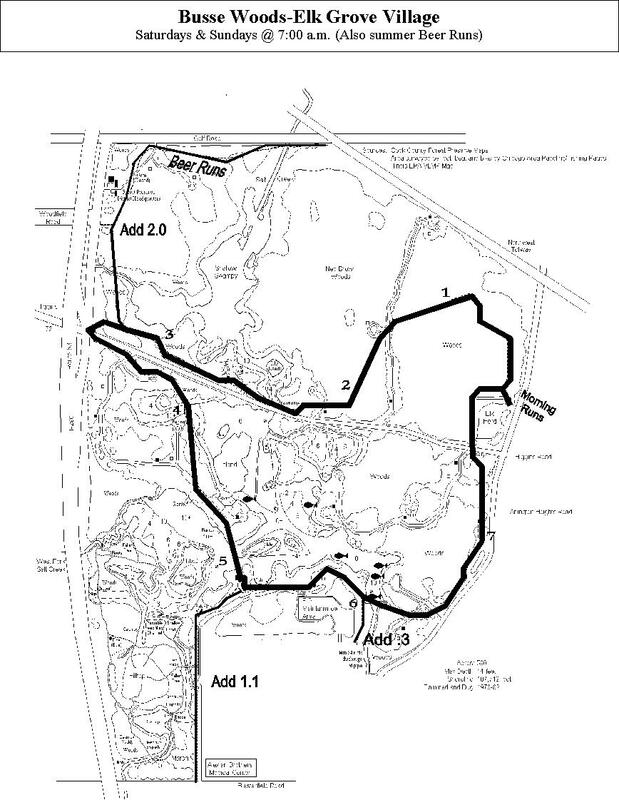 Walking groups too.You may 'cut' the course for a short run. Bring some food/beverages to share after. 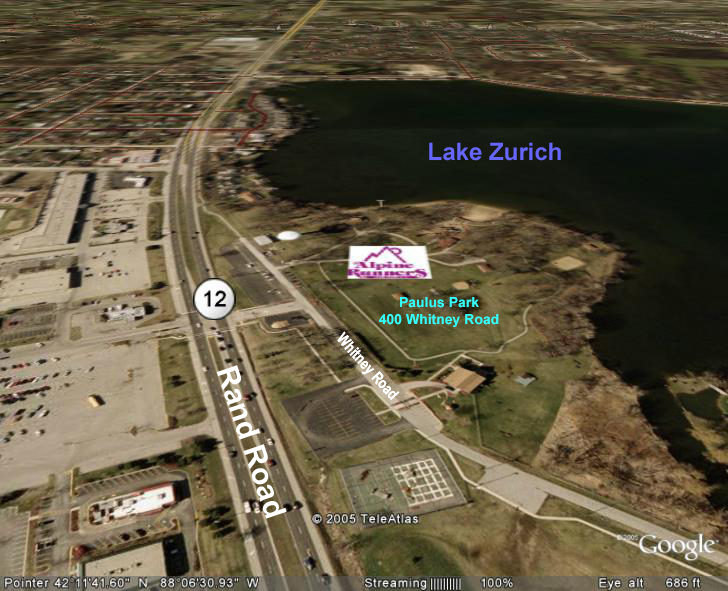 The Alpine Runners' Tuesday Evening Fun Run meets at 6:30 p.m. at Lake Zurich Barn located on Rte. 12 (Rand Rd. ), 1/2 mile north of Route 22 (on the east side). Notes: Some runners meet at 6:15 PM for a 1 1/2 mile warm-up. Distances vary from 5 1/2 to 7 miles. Call Beth Onines at 847-209-8843 for more details. See map for location.